You've been watching them all season long on the DCI Fan Network...and now your chance has come to pick a winner! 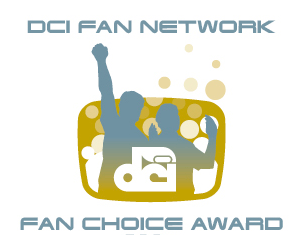 The DCI Fan Network Fan Choice Award will be awarded to one World and one Open Class corps at the DCI World Championship Finals this Saturday, Aug. 14. It's all up to you! 1. Log in to your Fan Network account. Not a subscriber? Sign up today! 2. Click on the Fan Choice Award graphic on the video tab. 3. Pick your favorite Open and World Class corps from 2010. Need a refresher? Check out complete corps performances in the "2010" video section. Also don't forget, the Open AND World Class Semifinals will be webcast live this Friday to give you one last chance to sway your opinion as you work to pick the winners. Pick your favorites before 11:59 p.m. ET on Friday, Aug. 13, and votes will be tallied shortly after. The fan-favorite Open and World Class corps will be announced and recognized with the Fan Choice award during their respective World Championship Finals awards ceremonies on Saturday, Aug. 14. Fan Network subscribers have it all, from unlimited access to the Drum Corps International audio/video vault, to live Webcasts from some of DCI's most exciting events, to on-demand replays of select corps performances available from the '10 summer season. Learn more and become a DCI Fan Network subscriber today!